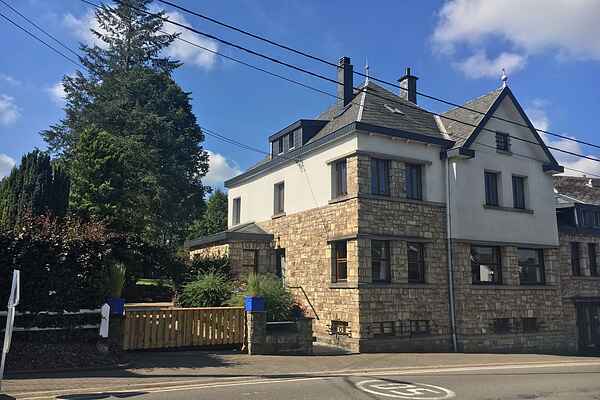 Large holiday home full of character, with a large garden, fitness room, billiards room, sauna, home cinema and games room offering table tennis, table football and darts. This large holiday home has a living room that includes a spacious sitting area, a fireplace and a dining area seating up to 22 people. There is a large kitchen which is fully equipped and the home also offers a home cinema area. The fitness room is located downstairs, as well as the billiards room which has a bar. On this floor, you will also find the sauna with shower and cold plunge for total relaxation. There is a playroom for the children, too. The house has a fenced off garden and is suitable for all ages. The region offers lots of activities and sights, like Reinharstein Castle and Robertville Lake, both located within 6 kilometres of the holiday home. Bütgenbach Lake can be found at 8 kilometres from the house. The village of Malmédy is only 8 kilometres away and The High Fens nature reserve is 10 kilometres away. The skiing area of Ovifat is located 7 kilometres away from the house. Our holiday houses are especially furnished to accommodate families.